Louisville Slugger Custom Wooden Baseball Bat Walking Cane with Hook Handle - Natural Finish - Laser Engraved. Natural Northern Ash wood with black laser engraving. Recipient's name is engraved in the identical fashion previously reserved solely for Major Leaguers. Up to three lines can be personalized - maximum 24 letters and/or spaces per line. Made in the USA with a genuine Louisville Slugger wooden baseball bat. Please enter the text you would like engraved on your bat cane. 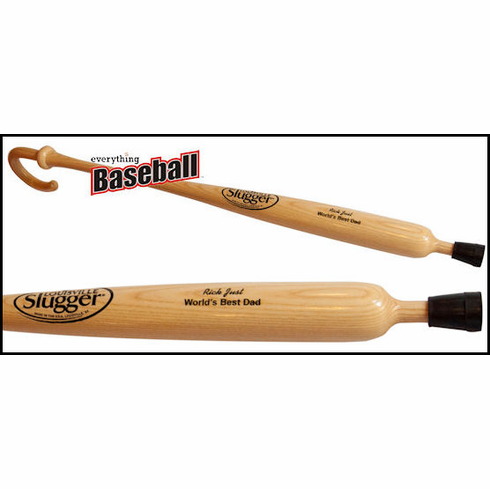 Most orders include GENUINE on line 1 and LOUISVILLE SLUGGER on line 3 with one line personalized in the middle...unless you want all three lines personalized with other information.